Thankyou for purchasing a Jayâ€™s RPD Camshaft. You have purchased something that has taken many hours to develop and will give you many hours of enjoyment whilst annihilating our commodore rivals. There are some things to keep in mind though. When fitted correctly, this cam will function for a very long time, however if short cuts are taken you may experience problems. Whenever performance parts are fitted to a non new engine you run the risk of failure due to aged parts such as valves pistons springs chains ect, and varying degrees of quality. Although chances of this are very slim because they are BUILT FORD TOUGH, you still need to consider this. Due to so many variables involved in the modification process of your motor, we can not be accountable for failure of any component once this cam has been fitted for these reasons. On our Rspec 3 and larger profiles or if you have had your head shaved, you will need to check your piston to valve clearance. This is a fairly simple procedure however it does take some time and requires a fair amount of precision. You MUST have AT LEAST 0.080â€ clearance on your inlet valve and 0.100â€ on your exhaust valve. This is to compensate for the expansion of all your internal components as they heat up under normal engine operating conditions (if you overheat your motor you will run the risk of clipping when running the absolute minimum clearances). Another thing to take in to consideration is that hydraulic lash adjusters/lifters can experience what is called pump when run higher than about 6000-6500RPM. This is because the lifter canâ€™t bleed off the higher rate of oil that is being pumped at higher than 6000-6500RPM. It depends on your lifter design, however if you do have an ECU that has let you override the REV limiter then stay under 6000RPM for your engines sake. 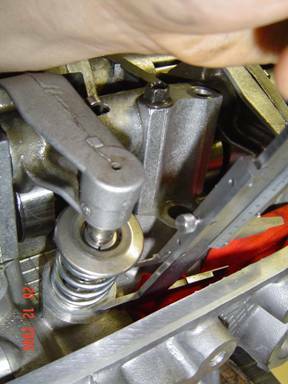 Checking clearances starts by removing the rocker gear. Ive found that 2â€ wide packing tape is the best thing from keeping your lifters from falling out. You simply slide it between the HLA and the valve stem then wrap it around the top of the rocker. It is easier to remover the rockers when all the bolts have been removed completely as they tend to hang up on the dowels for the rockers. Be sure to stuff some rags down here so that you donâ€™t drop any collets, retainers or the odd stray HLA. This is what I call the Ford Abyss. Now to removing the cam. You will need to undo the 17mm bolt that holds the cam gear to the cam. Make sure that you donâ€™t drop this in to the timing cover cause itâ€™s not fun digging it out. Get your new cam and have it ready next to the car. Get yourself an assistant who can remove and replace the cam for you. Hold up the cam gear and slide it off the end of the cam, making sure not to let the tension off the cam chain as you will allow your tensioner to come out and you will need to reset your tensioner if you do. Get your assistant to remove the old cam and exchange it for the new cam. They can be a little bit difficult to break the oil seal on the old cam but once you do it will come out of the head easily. Without letting the slack off the chain, refit the cam gear to the cam ensuring that the dowel finds its home. Now clean out your bolt and bolt hole and lock tite it in there at about 50-60Nm. 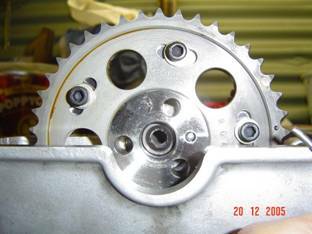 If youâ€™re fitting a vernier cam gear you will need to let the slack off as you will need to feed the old cam gear out of the timing chain and fit the vernier cam in to it. 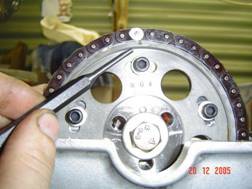 Remove your tensioner from the timing cover to relieve all the slack on the cam chain. Refer to your ford service manual for this task. Use some chalk or a paint marker to mark where your original cam gear went in to the timing chain. There is a mark on you cam gear which will correspond with a mark on the new cam gear. This is essential to maintain your correct cam timing. Be careful not to drop the timing chain in to the timing cover as you run the risk of having the chain jump a tooth on the distributor gear or the crank gear. With the tensioner still out, refit the cam gear to the cam and fit the cam bolt as listed above. Once itâ€™s all back together then wind your motor over until the mark on the harmonic balancer is reading TDC. Your cam gear mark should either be on the LHS or the RHS of the motor. You want the mark to be on the RHS when looking at the motor from the front. When @ TDC your mark should be 3 degrees above the head. Refit the tensioner as described in your ford manual. Next is to pull all your lash adjusters out of the rocker gear. Ive found that a pin punch and a socket is the easiest way of achieving this. Keep them all in their specific order as you will need to put them back in this way. Pull #1 intake and exhaust lash adjusters apart as you will need to use the body for checking the clearances. You will need to shim them up so that there is zero to very minimal clearance between the lash adjuster and the valve tip. You may need to shim them a couple of times but it wont take long and keeping in mind that you only have to do this for one cylinder. This is a 0.0015â€ feeler guage, you donâ€™t want any more clearance than this between the solid lifter and the valve stem tip when checking piston to valve clearances. Now to checking your piston to valve clearance. To do this you need to make one of these. All it is, is an old spark plug that I have taken the porcelain insert out of by grinding around here, then grinding down an air fitting so that it would fit in the hole. I then braised the fitting together. 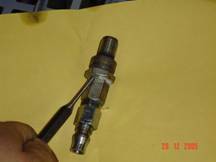 Take all your spark plugs out and put the car in to neutral, then fit this to your #1 spark plug hole. Hook up a compressor to the fitting and SLOWLY turn the air tap on. The engine will jerk to position where it will find BDC. Its best to get it somewhere close to BDC because if you have it at TDC and it all of a sudden decides to turn over, you could loose your fingers in the cam chain ect. SO BE BLOODY CAREFULL. Your safety is the most important step in car modification. When the rotating assembly has stoped turning, observe the mark on your cam gear. It should either be pointing upwards or downwards. You will hear a slight hissing sound coming from out of the timing cover and this is normal as the compressed air is getting past your piston rings. Make sure you leave the compressed air turned on, other wise you may drop a valve into the cylinder. If your compressor is not holding pressure or is leaking fairly rapidly, DO NOT PROCEED ANY FURTHER UNTILL YOU WORK OUT WHY!! It could be a stuck valve or broken piston ring, the list is endless. Next is to remove the #1 valve springs. To do this you will need to get a valve spring compressor, a magnet and follow the pictures. Here Im using the magnet to get the collets out. You may need to give the retainers a small whack with a hammer and punch to free the collets from the retainers. Donâ€™t go overboard though because you might drop the valve in to the cylinder. 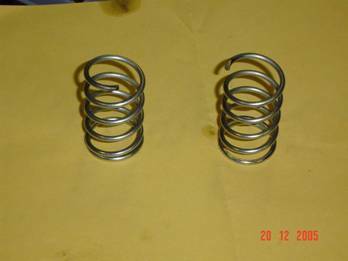 The valve springs then slide off, undo them carefully to make sure that they donâ€™t spring out and break something. Now you will need to get some springs that you can compress with your fingers. You still want them to be fairly firm but you need to be able to move them about Â½ an inch. I bought these from my local hardware store for about $3 each. They were a bit long but my dremel soon enough took care of that. 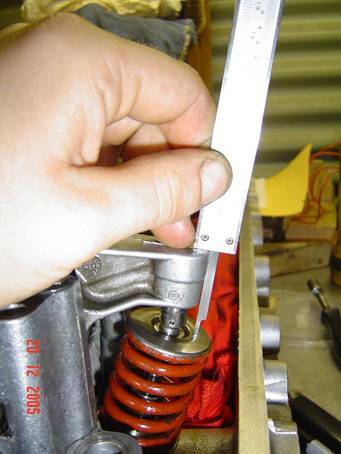 Fit these checking springs in place of the originals by reversing the order of removal. Only when the collets are happily seated in the retainers can you turn the air valve off on your compressor. Let the air bleed down for about 30 seconds then remove the hose from the fitting (the fitting can stay there as you will be using it again in about 5 minutes). Leave the engine at BDC on #1 for the time being. With your HLAâ€™s set up to zero lash, nip them up with only 4 rocker bolts around the 2 rockers being used. Wind your engine over until the TDC marker on your harmonic balancer is at TDC, and the cam gear mark is on the LHS. This is not the most accurate way of checking where TDC is however it will be very close. Now you will need a set of vernier callipers or a dial indicator and magnetic base. Verniers are probably the easiest way but I will explain how to measure with both. With the valve open due to overlap, measure the distance between the valve spring pad and the retainer where the valve spring seats in. Make sure that you write this figure down to 0.001â€. Do this for both intake and exhaust valves. We will call this figure â€œAâ€. Next measure the distance between the same 2 points but with the valve sitting on the top of the piston. 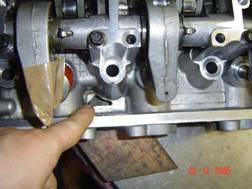 Be sure to only push on the rocker arm and not the retainer as the collets can easily fall out if you do. Do this again for both valves. Write this figure down also to 0.001â€. We will call this figure â€œBâ€. Now subtract figure â€œBâ€ from figure â€œAâ€ and you will have your piston to valve clearance. You should also measure the clearance @5 degrees BTDC on the exhaust valve and 5 degrees ATDC on the intake as piston to valve clearance at these points is also very minimal. 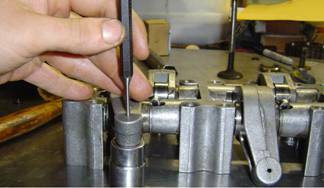 The same principle applies to using a dial indicator only that you will measure the difference between the 2 points by setting the dial indicator up on the valve retainer. Then you zero the dial indicator and push down the rocker arm to measure the travel of the valve until it hits the piston top. If for instance you have 0.050â€ clearance on your intake and 0.200â€ on your exhaust, using your vernier gear to retard the cam timing a degree or two will bring things back in to tolerance. The reverse clearances can be cured by advancing the cam timing. When your satisfied that you have the required clearances, remove the rocker gear and proceed to change all your valve springs over to the high performance ones that you have purchased. Make sure that you take care in not getting ahead of yourself with the compressor and winding the engine over. 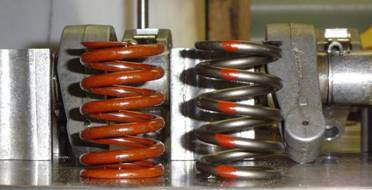 High Performance valve springs have certain qualities which make them distinct from std units. Here is a comparison between the two so that you can see for yourself the difference. Notice the std XR6 spring (red) has more coils than the Crane Cams High Performance variant. This increases the lift capabilities of the spring before it reaches coil bind, and also helps to give you a higher spring rate rather than just increasing the wire diameter. A recommended modification for the collets is to grind them so that they have clearance in the retainer. This helps to reduce the risk of the valve stem pulling out of the collets under high spring pressures and sharp opening and closing ramps of high performance camshafts. Photos of this modification are on the next page. Shimming required will usually be 2-5mm depending on the cam profile and head modifications. When doing up your rocker bolts, the Ford manual states to do them up to 25Nm, however Ive seen a couple of threads strip out at this torque so I recommend only to do them up to 10-15Nm. This is an exploded view of how the HLA assembly is assembled. Please not that the standard Ford shim that Im pointing at must be put in with these three slots facing the lifter assembly, and not the top of the rocker arm. To shim the HLA assembly all you need to do is either add or remove these washers that I have included here, or vary the thickness of washer used to get more accurate clearances. The retainer that Ive circled here should be left out when using reground cams as it can hold up the HLA in the machined rocker arms which will cause an annoying lifter tick. You will experience some ticking noise from the lifters upon start up, however this is normal and will disappear after 5-10 minutes of driving. It will not go whilst the motor is just idling so you will need to drive it gently until it does. From there on you will experience high performance quiet engine characteristics under all conditions. 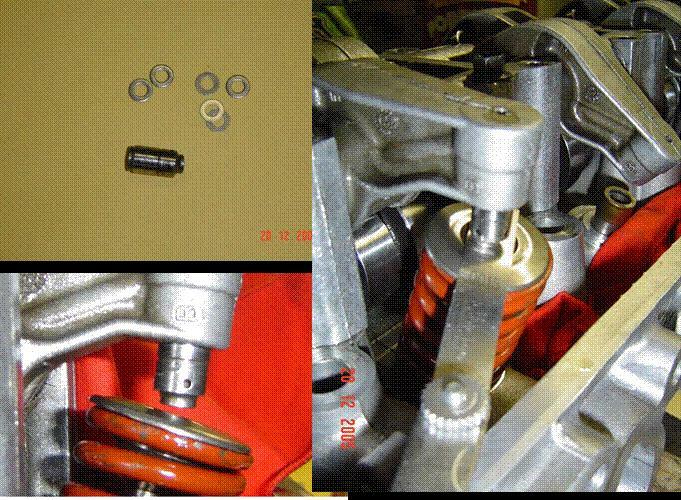 Document description: Jay's RPD Camshaft setup guide. Document written by: justfordima on 10 2006>, Copyright © 2006 justfordima, all rights reserved.